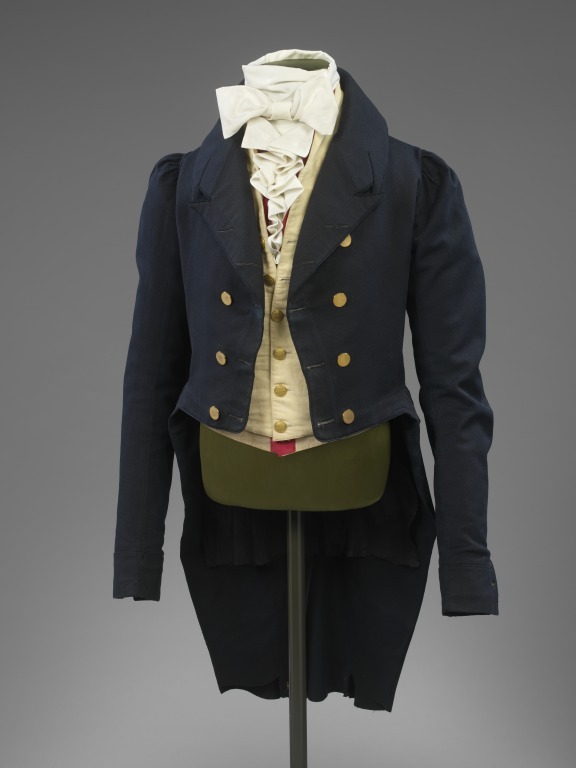 The cut-away coat remained formal daywear for men until the 1850s. 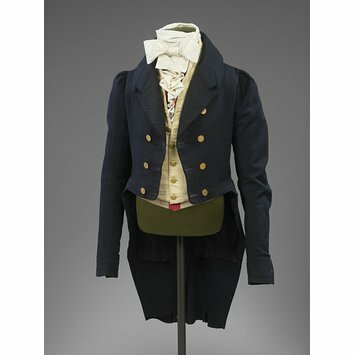 This example has long tight sleeves, puffed at the shoulder, a style typical of the period 1815-1820. The roll collar has an M-shape notch, introduced about 1803, and a waist seam. Double-breasted coat of blue wool, cut away in the front. With a fairly deep roll collar, a double row of five brass buttons, and four further brass buttons at the back. The wrists fasten with two cloth-covered buttons. With oblique false pocket flaps, one on each side, with deep pockets below them entered vertically, and another deep pocket inside entered horizontally. Lined with wool. Hand-sewn.